zCover Inc, the leading manufacturer of fashionable silicone protective cases, has announced today the release of their zPrinting Pro Tools program Keyboard cover. With precision moulding and printing process, the zPrinting Pro Tools program Keyboard cover turn your normal keyboard into a fully functional Pro Tools audio editing keyboard. This zPrinting Pro Tools program Keyboard cover designed for Mac users to run pro tools with pre-printed program shortcut icon and key letters on their Apple Keyboard or the Apple Wireless Keyboard. 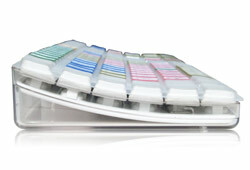 zPrinting Pro Tools program Keyboard cover is made of high quality silicone and is applying high printing know-how. The printing will not peel off or fade. It fits every contour of your keyboard and it won't slip or slide while you work. This durable short cut key cover offers more flexibility for the editors. "It took us years to develop printing technology for our silicone covers. zPrinting is one of our key business." said Sean Sa, vice president of zCover Inc. "The editors can now use the zPrinting covers with the best value for their money. The printings will not peel off or fade as they are blended prior to moulding. Its extraordinary durability and perfect fit will win your lasting affection and loyalty"
The zPrinting Pro Tools program Keyboard cover fits Apple Keyboard & Apple Wireless Keyboard.